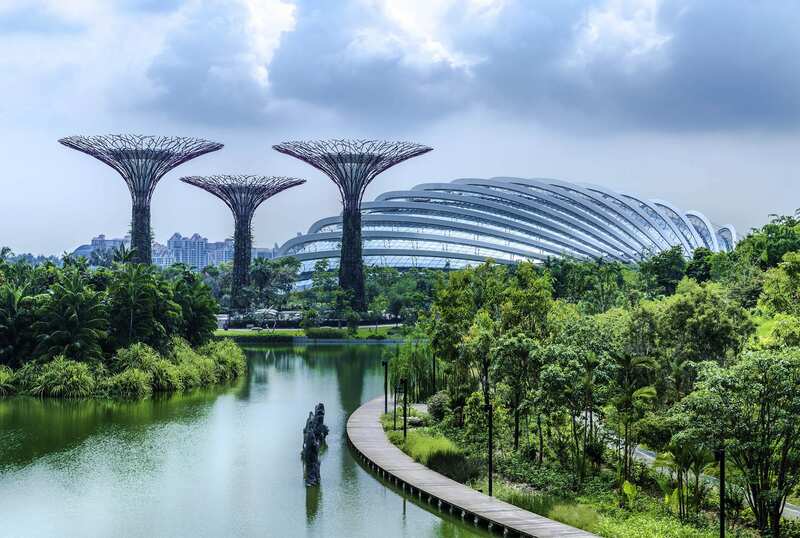 Whether as a stopover on a longer trip or as a destination in its own right, the status of Singapore as a travel destination is well entrenched. Marissa Carruthers spends 48 hours in the island state. The ride from Changi International airport always leaves me dazzled. My eyes lap up the tree-lined, functional roads with rows of colourful, manicured flowerbeds serving as a barrier to oncoming traffic. Sprawling parks whizz by. Trees, trees, trees; green is seemingly everywhere, despite the rustic shophouses shadowed by the shimmering skyscrapers and shopping malls, and there isn’t a scrap of litter in sight. This comes as a welcome contrast to the Cambodian streets I know so well. The short drive to the city centre meant we were checked into our hotel within no time. Arriving just ahead of dusk, we headed to the Singapore Flyer to catch a unique glimpse of the city. After forking out a hefty $33 – more than $1 a minute – for each adult (children $21), I wasn’t given time to worry about my crippling fear of heights because, in the surprising absence of a queue, we were whisked into one of 28 gently rotating, giant glass capsules. Stretching 541 feet into the air, this architectural feat offers bird’s eye views that stretch out across Marina Bay, taking in the jagged silhouette of the central business district’s soft-lit skyscrapers, across to the peppering of dots floating in the expanse of water – the cargo ships that frequent busy Singapore Straits – and everything in between. Ready to explore the city mapped out beneath us, Chinatown was next. Despite sitting in the shadows – literally – of modern Singapore, Chinatown is like stepping into another country, and pays testament to a bygone Singapore. The historic area sees the modern world collide with the old, with traditional shop houses transformed into trendy stories, coffee shops and restaurants, or flogging an Aladdin’s cave of paraphernalia, herbs, fruits and spices. The smell of traditional cuisine wafts down the streets, and a healthy smattering of Chinese, Buddhist and Hindu temples welcome respectful visitors. Shopping was a must – even if it was partly wasted lusting after dream-only dresses in the many designer stores, such as Louis Vuitton and Chanel, which dot upmarket Orchard Road. Singapore is a shopaholic’s paradise, rammed full of malls, lively lanes brimming with boutiques, and colourful markets. Avant-garde Haji Lane is a fashionista’s heaven and is steeped in old-world charm, with the narrow shophouse-lined lane home to a hip retail stretch. Here, stylish spaces stock everything from uber-trendy tailored dress shirts and bold patterned fabrics, to chic cushion sets, one-off art pieces and home accessories. Accompanied by a photographer friend, a visit to price up equipment at Sim Lim Square, where prices sit at 10 to 20 percent cheaper than elsewhere, rounded off our spree as we made our way to Little India. Home to the city’s third-largest ethnic community, Little India’s streets are a hive of the sights, sounds, smells and colours of Indian culture, but it is the vibrant neighbourhood’s food that stands out. The aromas of the multitude of spices being cooked up in the many kitchens lure hungry passers-by, with a selection of authentic dishes, from spicy fish pulusu to fish head curry. Our afternoon was spent in the Marina Bay area. Having been in the absence of a garden since moving to Phnom Penh four years ago, Gardens at the Bay promised plenty of opportunities for me to get my flower fix, and it didn’t disappoint. Days could easily be spent roaming around the 101-hectare horticultural site, but with time tight, we kept it limited to the highlights. As well as being home to flowers and plants from the Mediterranean and semi-arid regions, the Flower Dome structure itself is just as impressive on the eye. Listed in the 2015 Guinness Book of World Records as the largest greenhouse in the world, the huge 1.2 hectare conservatory replicates the cooler climates of South Africa, California and parts of Spain and Italy – so don’t forget a jumper. The Cloud Forest was another must-see, with the enclosed compound taking in a 35-metre tall “mountain” veiled in mist. Standing as the world’s largest indoor waterfall, bridged paths take visitors up into the sky, through lush vegetation found in tropical highlands 2,000 metres above sea level. 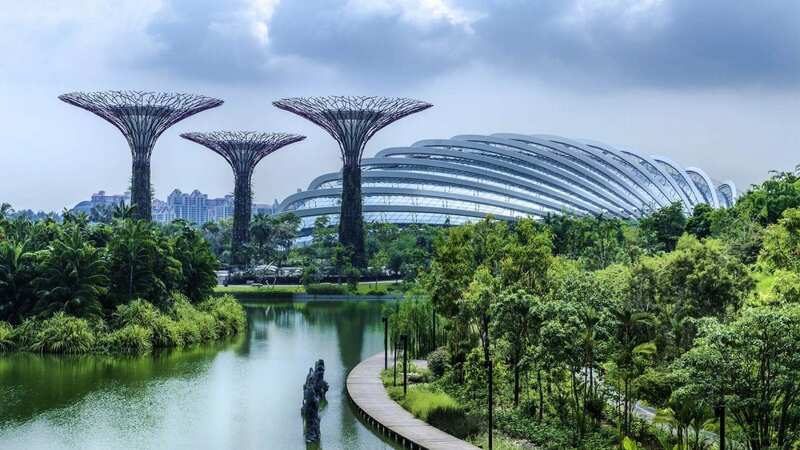 With the sun starting to set, we joined the quickly-growing queue for the OCBC Skyway – a 128-metre long aerial walkway that winds in and out of the Gardens’ futuristic Supertrees. Acting as canopies to the sun during the day, by night the 22-metre tall “trees”, which belong in a sci-fi film, come to life, with thousands of twinkling lights sparkling from each branch. Hungry, we put food on hold to catch the daily Wonder Full show on the waterfront outside Marina Bay Sands. The free 15-minute spectacle is a show of light, sound, music, water and bubbles, with the iconic cityscape acting as a backdrop. On the hunt for cheap eats, we headed to bustling Maxwell Road Hawker Centre in Chinatown, where we jostled for a seat at one of the heaving tables to tuck into chicken rice, popiah (fresh spring rolls), dumplings and spinach noodles. With our flight at 4pm, we decided to spend the morning at Sentosa – a built-up island resort with a 2km beach, golf courses, 14 hotels, Universal Studios Singapore, casinos, a water park and S.E.A. Aquarium. The latter is home to more than 100,000 marine animals of about 800 species. Visitors can wonder through glass tunnels with menacing sharks circling above or across transparent floors with lively leopard and blue water flasher wrasses swimming below. Spot rare coral and Finding Nemo fish; stroke squidgy sea cucumbers and starfish, and be hypnotised by the electric jellyfish. Make sure to stop off at the Open Ocean section – a glass wall offering a glimpse into deep marine life – to stand in awe of the gentle giants of the sea, such as the leopard shark, goliath grouper, saw fish and manta rays. Having worked up an appetite, we stopped off at Singapore Seafood Republic on the waterfront. Here we donned our paper bibs as we prepared for a messy feast made up of the restaurant’s signature chilli crab, prawn in mayonnaise and scallops with yam – delicious. With our flight looming, our short but sweet time in Singapore was coming to a close so the airport was our final stop, with just enough time for some duty free shopping before the brisk two-hour flight home.